Costa Adeje on the south coast of Tenerife is located just west of the lively resort of Playa de las Americas and its pulsating nightlife found on the famous Veronicas strip. Costa Adeje is a recent resort community that combines the best of both worlds. It's close to some of the hottest action and fun in the Canary Islands but it's far enough away to ignore and have a peaceful and relaxing holiday. Costa Adeje is known for its wide assortment of accommodations, all priced and sized to meet your needs, there are however plenty of new luxury 4 and 5 star quality hotels in this region to suit the most discerning visitor. There are shops offering local handicrafts, souvenirs and jewelry. The nearby Torviscas market is held twice a week and offers countless opportunities for bargain and souvenir hunters. Costa Adeje is a striking location with much to offer in the way of black, glittering beaches of volcanic sand and clear water that seems meant for scuba diving and snorkeling. If you want to spend most of your holiday outside, Costa Adeje is one of the best places in the Canary Islands to do so. Take advantage of the whale-watching tours where you can watch whales and dolphins swimming in their natural environment. There is plenty to do during the day whether your taste is more for windsurfing, or you find you'd rather relax on a three hour boat tour of the coast, you'll find plenty of options. When you're tired of the beach, but still interested in the water, head to one of Costa Adeje's many water parks. You can find slides that stretch into the sky and float on an inner tube down an artificial river. If golf is your sport and you're interested in doing some golfing on your holiday, you'll find Golf Costa Adeje, a 27 hole course that is one of the most popular courses in Tenerife. The course itself was designed to take advantage of the natural terrain, and playing a round there will take you through some of the most beautiful landscape Costa Adeje has to offer. Whether you are looking for a cheap last minute hotel or a luxurious suite in a 5 star property you will find it here in Tenerife. 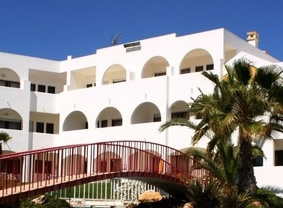 The resorts all have good self catering apartments, a wide choice of hotel styles and board arrangements including a good selection of all inclusive properties.